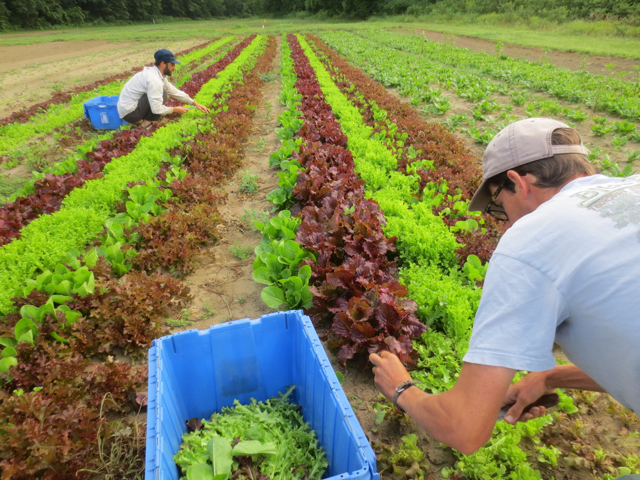 Root 5 Farm is a certified organic vegetable farm located on 38 acres in Fairlee, Vermont, along the Connecticut River. The fertile river bottom soils provide a rich environment for growing over 100 different varieties of vegetables, herbs, and flowers. The land opens to views of Cottonstone Mountain and Blackberry Hill, across the river into New Hampshire. Root 5 Farm is owned by Benner Dana and Danielle Allen. 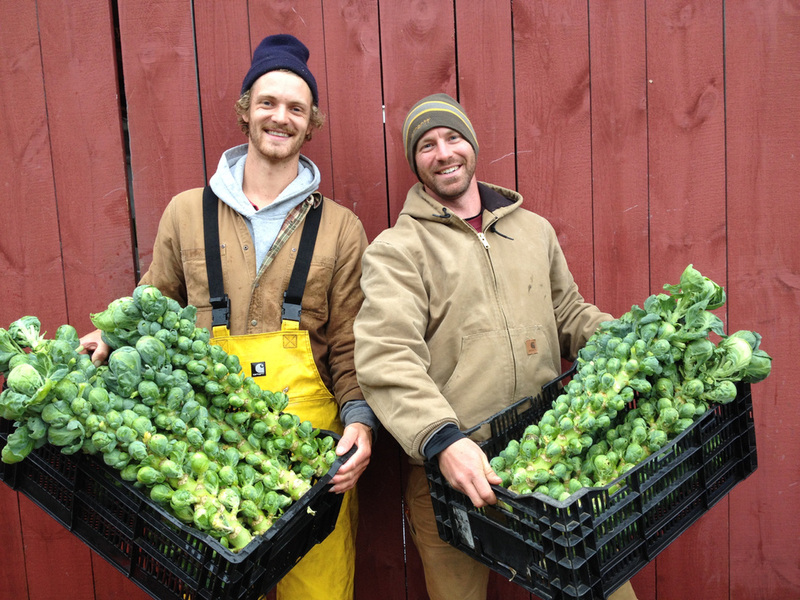 Products from Root 5 Farm are sold through local farmers’ markets, CSA memberships, local restaurants and small local grocers. "Organic production is not simply the avoidance of conventional chemical inputs, nor is it the substitution of natural inputs for synthetic ones. Organic farmers apply techniques such as crop rotations and the use of composted animal manures and green manure crops, in ways that are economically and environmentally sustainable. In organic production, overall system health is emphasized, and the interaction of management practices is the primary concern. Organic producers implement a wide range of strategies to develop and maintain biological diversity and replenish soil fertility.” ​Organic Agriculture Overview, USDA, Cooperative State Research, Education, and Extension Service (CSREES), 2007. The farm is beautifully situated on 38 acres of terraced land above the Connecticut River. The farm consists of four terraces above the river and it has excellent sandy loam soils for growing vegetables. Our lowest field, adjacent to the river is kept in hay. The upper fields are used for annual vegetable production. We have 1/2 acre planted to perennial asparagus, rhubarb, and blueberry crops, with plans to expand our perennial crop production in the coming years. Many of our vegetable seedlings are started in a heated greenhouse before they're transplanted by hand into the fields. We use a wood pellet furnace to heat our greenhouse and seed into soil blocks made with rich potting soil from Vermont Compost Company to make healthy transplants. The greenhouse is started every season in early March with onions, leeks, scallions, tomatoes, and peppers first in line. It also serves as an excellent space to dry and cure onions, garlic, squash, and sweet potatoes in late summer and fall. 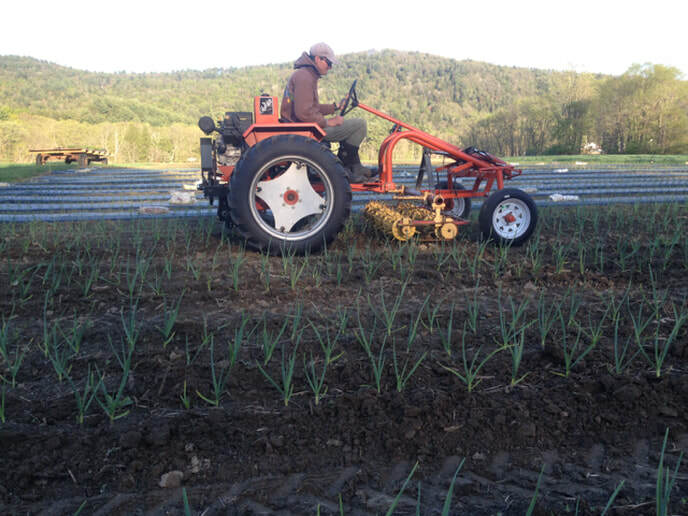 We grow several acres of cover crops each year in order to build nutrients and organic matter in the soil. Cover crops also hold the soil in place and prevent erosion when we're not growing a vegetable crop. We let cover crops like buckwheat and vetch go to flower, which provides excellent habitat for pollinators. While cover crops don't contribute directly to our farm's annual income, we know the value of building our soils and maintaining the health of our land for the future! We use row covers on certain crops to exclude pests and eliminate the need for using sprays to manage insect damage. 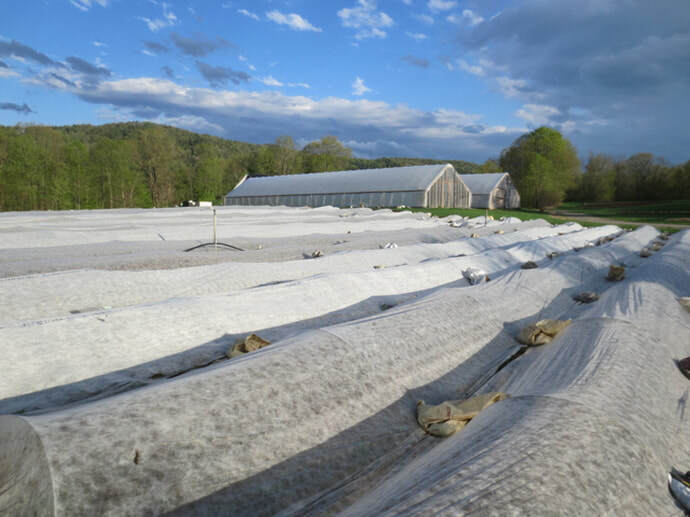 We also use row covers as a way to extend the season by keeping crops protected from frost. It takes a lot of extra work to manage row covers on our crops, but they're an important part of our organic production system. We take great pride in the freshness and quality of our product, and we carefully harvest our crops by hand at the peak of ripeness. During the height of the season, we harvest almost every day of the week to ensure our customers receive the freshest produce possible. We also work closely with Willing Hands and the Bradford Senior Center to donate extra wholesome food to neighbors in need. Season extension is important for farming in our northern climate. We have three 30' x 98' unheated high tunnels at the farm. 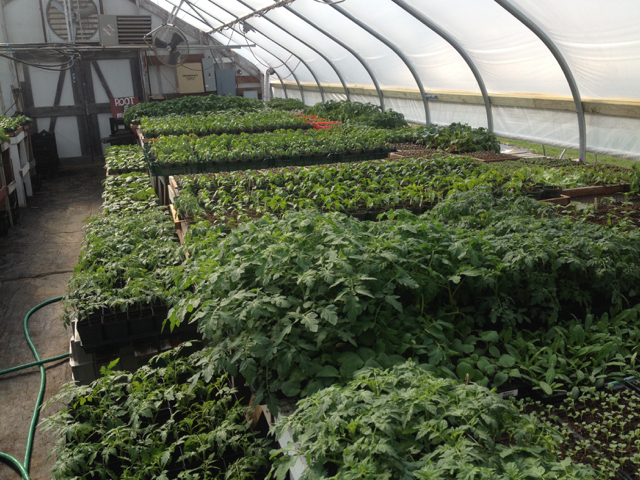 Early spring crops can be sown inside our high tunnels while there is still snow on the fields outside. 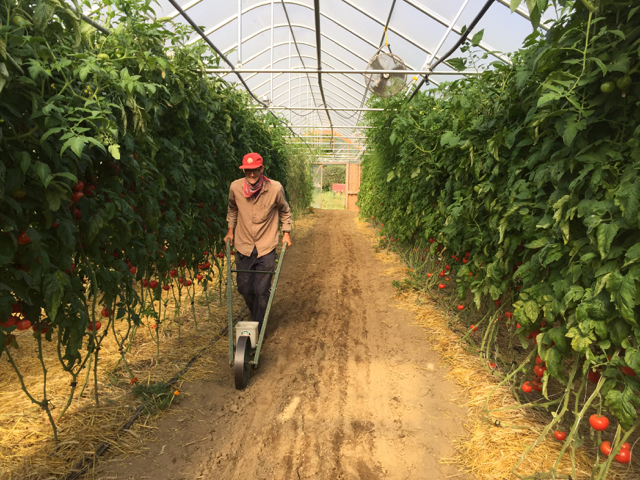 Heat loving crops like tomatoes, cucumbers, and peppers can be grown in the tunnels during the summer to get an earlier harvest and to protect plants from heavy rains and diseases. Hardy greens, like spinach and kale, can be grown in the high tunnels to ensure a fresh supply of greens during the winter months. 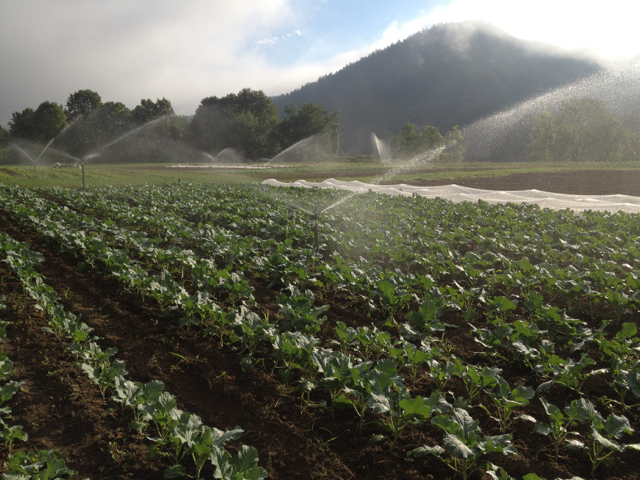 A good, clean water source is essential for vegetable growing. Our irrigation system is necessary because of the farm’s light sand loam soils and regular watering is important for healthy plant growth. We irrigate primarily in the spring and early summer, as we are seeding and transplanting many new crops in the fields. 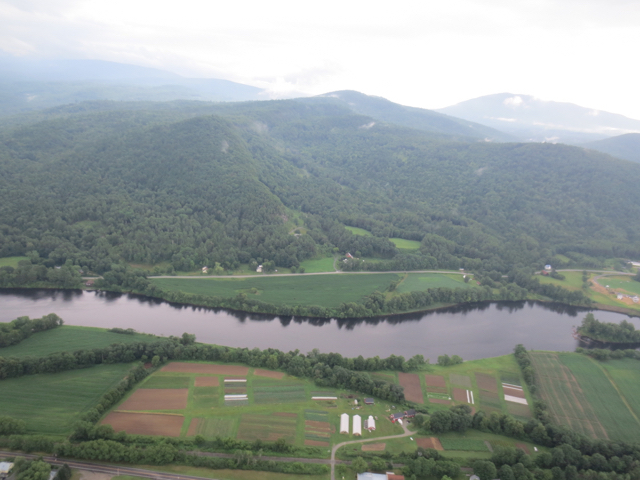 We draw our irrigation water from the Connecticut River and also from our well. Well water is tested annually. We carefully plan the rotation of our crops to manage our soil fertility and avoid problems with soil-borne diseases and soil-dwelling insects. This is an extremely important part of our organic management plan. Susceptibility to pests and diseases runs in plant families, so we plan our rotations by plant family. In addition, each crop has different nutrient requirements, which affects soil balance differently. So we also rotate by nutrient requirements. ​We control weeds through precise timing of tractor and hand cultivation methods and the use of stale seedbeds. We've developed a series of tools and techniques that work well on our sandy soil with the diversity of crops that we grow. Immediately after crops are harvested from the field, they are brought to the cool, shady barn to be washed. Produce is washed with clean cold water from our deep well, which is tested annually. Once washed, produce goes into a large walk-in cooler to ensure the freshness and quality. 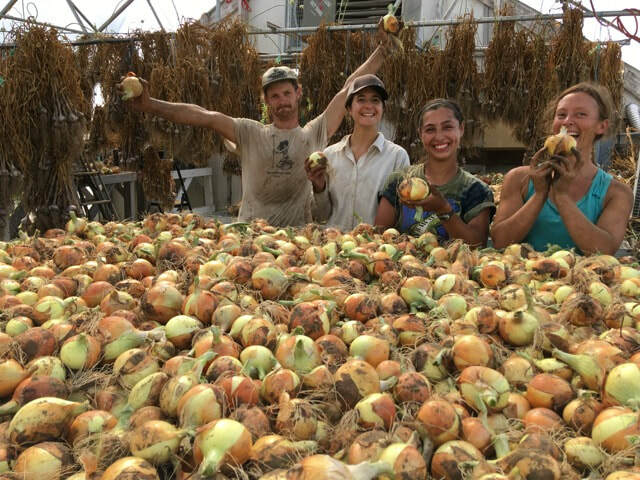 Ben and Danielle have both been farming organic vegetables since 2001. They found their separate ways to the University of Vermont in the late 90’s where Ben studied forestry and Danielle majored in political science. They didn’t meet until years later when they both independently came upon a love of farming. Ben got his start on a blueberry farm in Maine and then returned to Burlington, Vermont, to start Arethusa Farm at the Intervale in 2001. He and his friend, Thomas Case, rented 24 acres of river-bottom land from the Intervale Center, and they successfully grew certified organic, mixed vegetables, dry beans, and herbs for local wholesale and farmers’ markets. 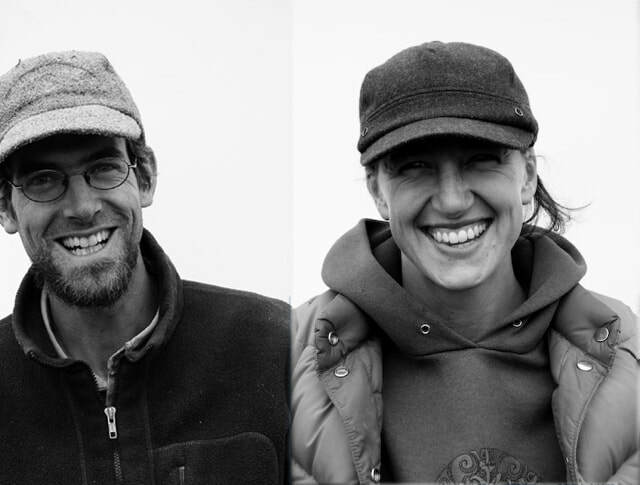 Eventually Ben and Danielle crossed paths when Danielle began working at the Intervale Community Farm in 2003, just down the road from Arethusa. Danielle was intrigued by Ben’s unusual hat collection, Ben thought Danielle had a nice smile, and the rest is history. Danielle gained valuable experience working at four different organic vegetable farms in the Burlington area. In 2006 she took a year off from farming to study Landscape Design at the Conway School, and shortly after joined Ben and Thomas to help manage Arethusa Farm. Ben and Danielle were married in 2009. 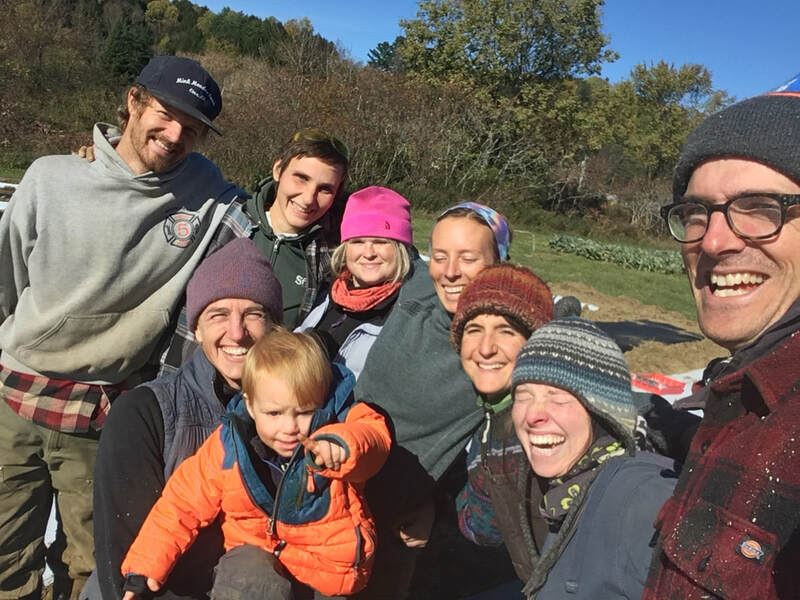 After working together to run Arethusa Farm for four years, they became interested in a longer-term investment in the land, and started a search for a farm to make their home. A devastating flood at Arethusa Farm caused by Tropical Storm Irene in August 2011 intensified Ben and Danielle’s search for new farm land, and they were lucky to find and purchase Your Farm, from Kevin and Laura Channel, in March of 2013. They moved to Fairlee just in time to get started seeding in the greenhouse and working the land for the 2013 season. In 2015, Ben and Danielle re-named the farm to Root 5 Farm. 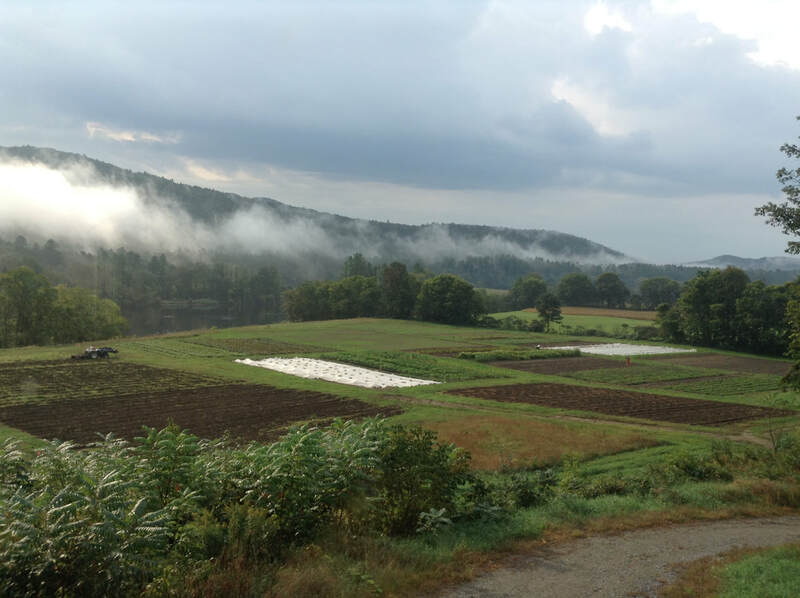 They're thrilled to continue farming the rich soil of the Connecticut River Valley and to be part of a community that supports organic farming. 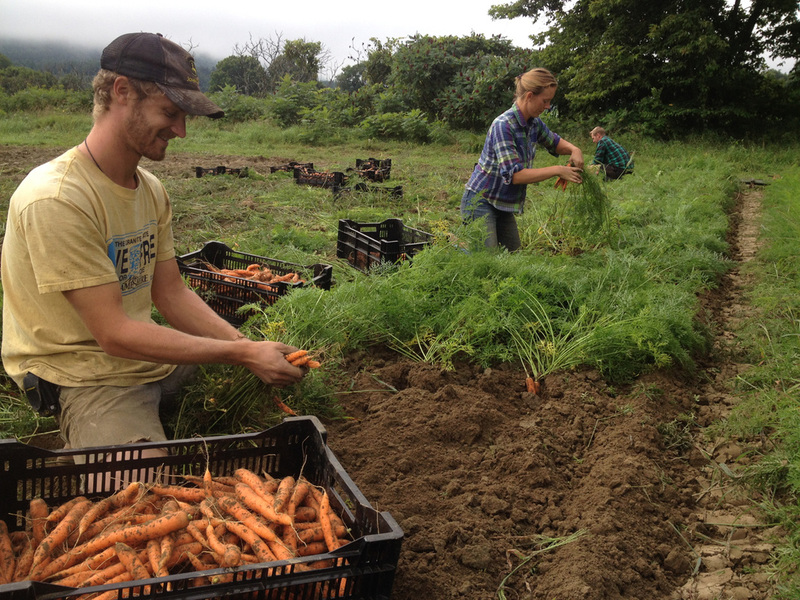 "We were initially drawn to farming in our pursuit of more meaningful and fulfilling work. It has indeed been the most fulfilling undertaking of our lives! Farming is challenging- physically, mentally, and emotionally. We devote so much of ourselves to our farm, and it can be humbling to realize, even after all the planning, some things are still beyond our control. Farming has taught us to accept failures and to be self motivated. ​Overall, we're proud to grow healthy, clean food for our community that people can feel confident about putting into their bodies. There is so much uncertainty in the food system, where it came from, what's in it, how it was produced, etc. We're glad to be able to eliminate those questions for our customers." Seth Bent, Hannah Banana, Laura Austin, Gillian Wyman, Sarah Herr, Cristina Pellagrini, ​Meg Winagle, Ben, Danielle, Bing, and G! Eva Loomis, Amir Lisak, Ben Blais, Danielle Allen, Ben Dana, Micah Monroe, John Gaeddert, Lisa Stone, Rhya Ghose. (missing from photo- Micah Munro, Joshua Allen). Interested in joining our crew? Go to our employment page for more information.